This post is meant as a guide for setting up a Raspberry Pi as a security camera. First, I will tell you what hardware you need and how to setup it up, then I will walk you through configuring the software, then finally how to view and archive your security footage. I used a Raspberry Pi model B because i had one lying around but you can do this with any Raspberry Pi that has the camera connector. I will assume you don’t have any of the items needed to get this done so if you do please use what you have. Otherwise, I encourage you to be adventurous and get upgraded versions. Place the Raspberry Pi into the case before making any connections. If your case doesn’t have a port for the camera don’t close it just yet. You will connect the keyboard/mouse, power adapter, camera, wifi adapter, HDMI cable to the tv/monitor and SD Card setup with NOOBS to your Raspberry Pi. Use the NOOBS setup instructions on the official Raspberry site to setup Raspbian. You can find a great video walkthrough on youtube. After Raspbian is setup your pi should boot up to the desktop. Everything from this point on will be done in the terminal. When the camera is mounted it will not have the keyboard/mouse or monitor connected. Therefore, we need to setup ssh to access the device. Please follow the official Raspberry Pi instructions for enabling ssh. Motion is the software you will use to monitor the feed and take images and video whenever it detects movement. I find this more efficient than 24/7 full motion video. Before you setup motion please setup your camera and verify that it is working. Here is a youtube video that will guide you though the process. The next step is to install and configure motion. Please follow the instructions on this youtube video. If everything when well you should have a Raspberry pi + camera with motion installed and capturing movement. You can get creative about how you mount the Pi but I decided to drill holes in the Pi case for my setup. First drill a hole into the top facing part of the case for your camera. It has to be just right for the camera to fit through. Place it slightly down from center on the side of the camera port so you have enough space to spread the camera cable once the case is closed. The extra cable should help the camera to stay in place. I used the above case because I had it lying around. You will notice I spray painted it but I still have all the other ports visible. For that reason I recommend getting a fully enclosed case. There are many different ways to do this last part but by now you should have a closed raspberry pi with camera hidden inside the case. The easiest way to do this is simply put the pi case in a universal cellphone mount. I went a step further and screwed the pi directly on the mount. I bought the following mount because it had the longest most flexible arm I could find. It is great if you need to mount it in an awkward position. Break off the plastic part which is meant to hold the device. You will be left with the screw that goes directly into the tip of the mount. remove the screw and put it to the side. Remove the raspberry pi from the case and drill a hole into the back of the case. The hole should be big enough for the screw to fit through. Then screw the back of the case directly to the mount and put the Raspberry Pi back together. Once the case is mounted and is facing the area you want to monitor, open the browser from a computer on your network and navigate to the webpage hosted on the Pi which allows you to see live footage. Please see the section on setting up motion if you are not sure how to get to it. All images are stored in /var/lib/motion on the Raspberry Pi. You can copy them to your local computer with SCP, setup a samba/nfs file share that other computers on your network can mount or sync the files to cloud storage. My next post will walk you through syncing the files to azure storage and deleting files over a certain age. The third post will either create from scratch or modify an existing ui to browse and search the images and video uploaded to azure. 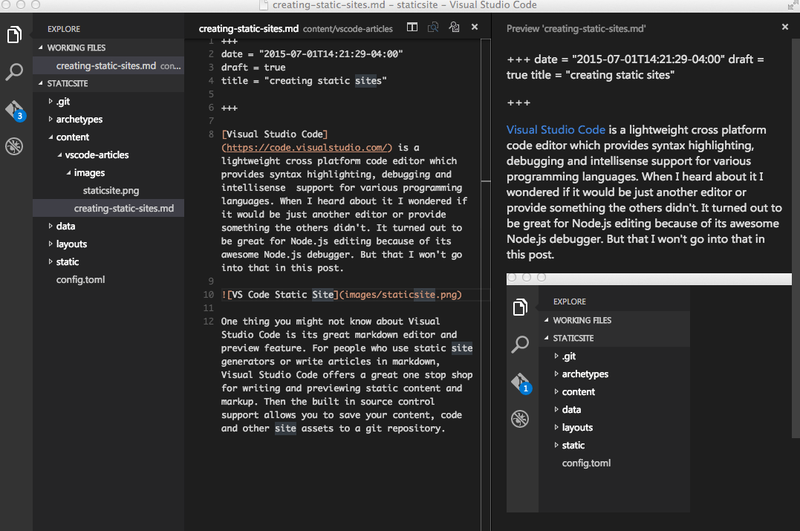 We will create a full text index for our media with the help of the Azure Cognitive API. A few months ago I came across the free law project and its awesome dataset of court decisions from around the country. I think it is amazing that everyday people can have easy and free access to a searchable index of court decisions. In addition to their front end search page and search api, they allow more advanced people to download their dataset using their bulk api. People are doing some pretty interesting things with this dataset. I even came across what looked like a decision prediction engine. I decided to use the dataset to create my own search index because it was the perfect opportunity to play around with Elasticsearch (a distributed search index). Note that I have no intention of replacing the existing functionality provided on courtlistener.com. This is more of an academic exercise for me. The bulk api outputs a compressed file containing opinions in xml format. I started off by creating a bash script which accepts one of the compressed files outputted by the bulk api, iterates over the opinions and get them ready for import into the search index. Creating the script proved challenging at first because I did not have enough disk space available on my MBP to store and processed the 12gb file. I then realized that i have tons of space available to me in Azure storage so I created an Azure ubuntu vm with an attached disk to test my processing script. At this point I was confident I could get everything done using Azure Worker roles. Getting Java installed was a no brainer. All I needed to do was create a startup script which downloaded and run the installer. After a few bruises and a couple of hours into creating the startup script as a batch file, I decided it didn’t make sense to be battling with batch scripts when I had access to the full .net framework and a much more modern scripting engine in powershell. I also decided that I should include the java installer in the project instead of downloading it because it made more sense to take that hit when uploading the package instead of during startup. Once I had a working powershell script which ensured java was installed, all I needed to do was configure and run Elasticsearch. 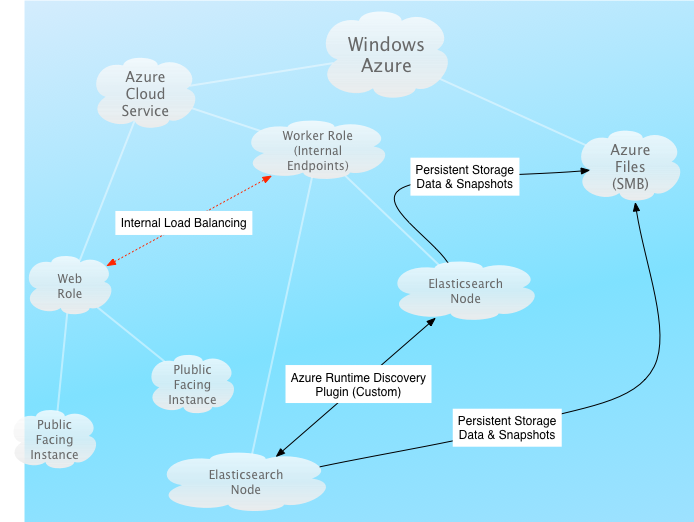 Azure PAAS is a mostly stateless environment so applications must point to some external persistent storage. I was thinking that I could attach a vhd and mount it on my worker instances but eventually decided to try the new Azure File service with SMB support. It turns out that someone had already thought of this and released some code which made it very easy to mount Azure file storage shares as mapped drives in worker roles. With that, my persisted storage problem was solved. Elasticsearch could store its data on what would look like just another local drive. It is interesting to note that this is the only aspect of this solution I could not test on the Azure Emulator. So the code uses resource directories for storage when in the emulator. Elasticsearch does not have an installer per se. Instead, you use platform specific scripts to run it or install it as a service. So all I needed to do in the RoleEntryPoint was start the process and wait for it to exit. Also, when then RoleEntryPoint exists I can have it stop the process. The Elasticsearch configuration can be placed in either a .yml or .json file. I didn’t find out about the .json file till after so I pulled in a project called YamlDotNet to programmatically write configuration values such as the node name (instance id) that would only be available in the RoleEntryPoint. 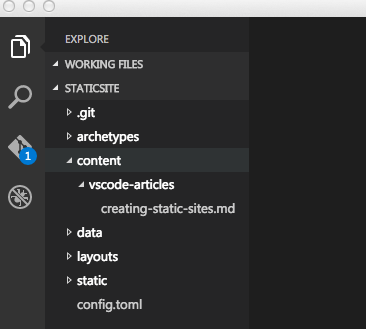 The deployment starts off with a base .yml, merges the base config with its own custom values in memory and writes the merged file to the final Elasticsearch config directory. I thought the discovery plugin would have been a walk in the park until I encountered a big problem. The Runtime API for java is supported by named pipes. Unfortunately, the named pipe is only available when using a ProgramEntryPoint in the service definition (I wish they would change that or at least make it configurable in the service definition). At this point I thought of moving the entire project to eclipse or using a console application as a ProgramEntryPoint but that took away my ability to simply run and debug in the emulator. Then, I thought if they were already using IPC for the java service runtime then it should be good enough for my solution. All I had to do was setup a mini server in the RoleEntryPoint that the java discovery plugin could communicate with. I did a proof of concept for both TCP and named pipes but eventually decided on named pipes because it was simpler. 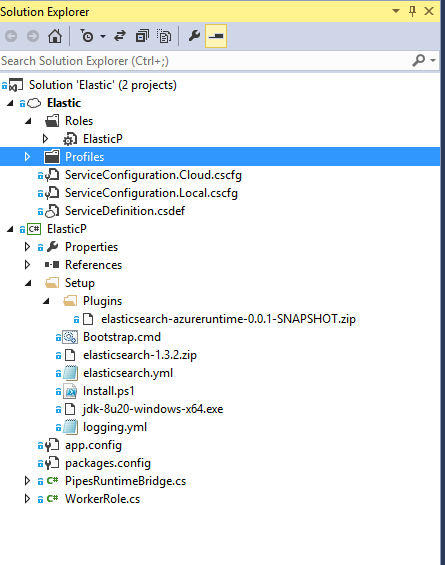 So with a working named pipes server answering all the questions about the state of the cloud service and the persistent storage for both data and snapshots abstracted away I was able to remove the dependency on the azure api for java in my plugin project. My goal for this solution is to not expose the Elasticsearch cluster publicly but rather create a WebRole with a custom ui and or another WorkerRole which exposes a custom api to interact with the elasticsearch index. Looking at the service definition and reading around the internet it seems that I can’t declare an internal load balanced endpoint which can only be accessed by my public facing roles. It seems like my only option is to write a thin layer which cycles through or returns random node endpoints from the Elasticsearch cluster. Elasticsearch is currently logging to a resource folder on the role, but I would really like to ship the logs somewhere. I am thinking that I can somehow hookup Elasticsearch logging to the diagnostic trace store which gets shipped to Azure storage or simply mount another Azure File share dedicated to logging. I also plan to read up on Logstash but I am not sure what value it would provide to my solution. Once I have all the configuration pieces in place, publishing this service will be super easy. With the click of a button (or two) I would have a private Elasticsearch cluster and a public facing website/api for interacting with it. I already have a script which will allow me to bootstrap the data but I have not thought of how to integrate it into the deployment workflow. The other challenge is scaling Elasticsearch. Scaling Elasticsearch is not as straight forward as adding more identical nodes to something such as a web application. You really have to put some thought into it. For this project I am thinking that the data, once bootstrapped, would be mostly read only. Therefore, the requirements will differ from other clusters. For example, I can have a set of main data nodes on one WorkerRole and a set of replica only nodes (need to read up on this) in another WorkerRole configured with autoscaling. This is the second post in a series talking about creating real time logging using chrome dev tools and real time communication libraries such as signalr. The first post focused on the server-side portion of the setup. This post will focus on creating the chrome devtools plugin which will display the logging information from the server. If you know html/javscript/css, creating a chrome extension is actually really easy. The only gripe I have is there seems to be no way to inspect dev tools extension panels.But, you can get around that by sending errors from window.onerror and try/catch to the inspected window or background page console. Another thing to keep in mind is certain features will not work if you don’t have the appropriate permissions in the plugin configuration. I strongly suggest reading the chrome developer documentation for a better understanding of how devtools plugins work. I will start off with a layout of the plugin files in the file system and explain each file in a logical order. This file tells chrome about the plugin and the various files it needs to work correctly. The “background” directive will instruct chrome to load an html page and include the three js files as scripts. Alternatively, you can create your own background.html and include the scripts yourself. The permissions control access to otherwise limited capabilities of the chrome extensions api. The devtools_page is where the plugin will create the panel used by the plugin to display the log information. This is the workhorse of the plugin. It will maintain all the connections to the server, receive the log messages and pass them out to the respective panels to be displayed. The connectionlib object is just a simple way to handle support for multiple libraries. The listener function is where all the magic happens. For every dev tools panel which connects to it, it will attempt to detect if the inspected page supports real time logging and connect to it. The background page will inject this code into the inspected window and if the it finds a meta tag with realtime logging configuration, it will send that configuration back to the background page. When I thought of ways the dev tools plugin could discover logging capabilities the first thing that came to my mind was meta tags. However, this can be achieved using custom headers or some other content in the page. Another option is to not use automatic discovery at all and opt for entering the url in the panel. This code is very simple. All it does is create our logging panel when devtools opens. This code will connect to the background page and wait for any incoming logs to output. This page contains the elements the user can see an interact with in the devtools panel. The log element will display all log messages. Highlight will be used for syntax highlighting in the messages. What I have described so far in my two posts is really all you need for a basic implementation of this real time logging concept. You can download highlight.js from http://highlightjs.org/. 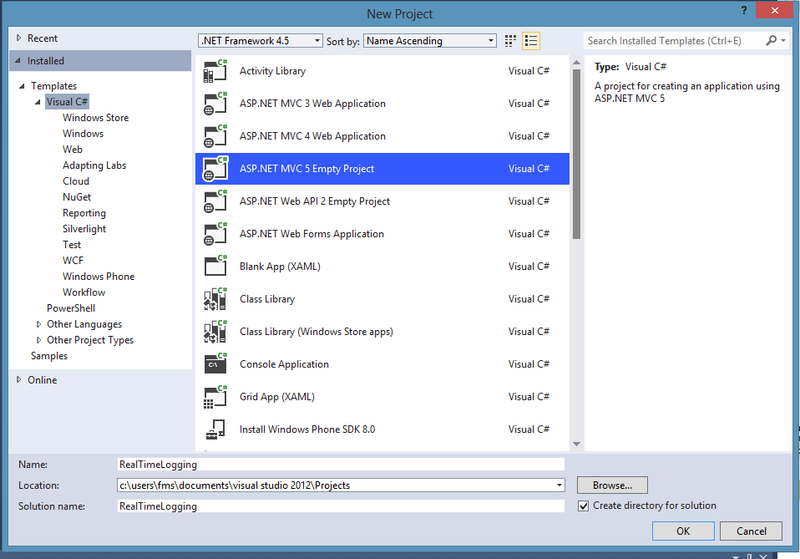 I was only able to get the signalR client files by creating a dummy project and adding it to the project via nuget. The code in this post is a really basic get your hands dirty example. I created a github project which I will use to take the idea further. You are free to download the plugin, try it out and send pull requests if you wish. 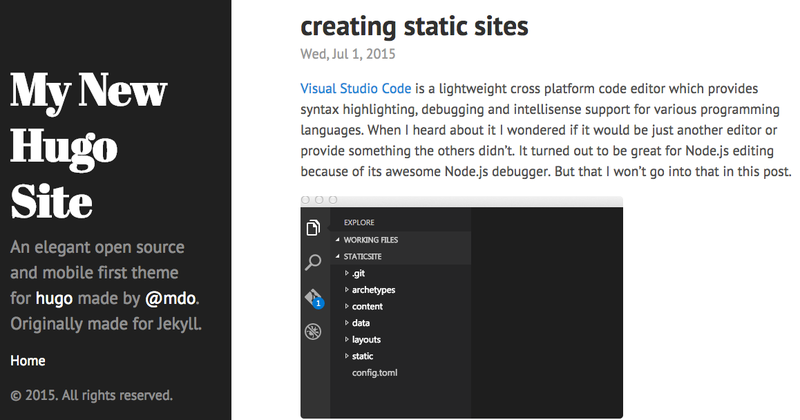 The project readme explains how to install and use the plugin. This post was created to document the process of creating a Google Chrome Dev Tools extension which will allow a web application or plugin developer to get real time log information in the browser while developing. 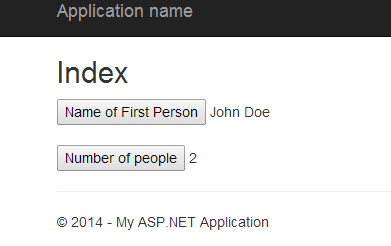 This first post will cover creating the web application which will log information to the dev tools extension. 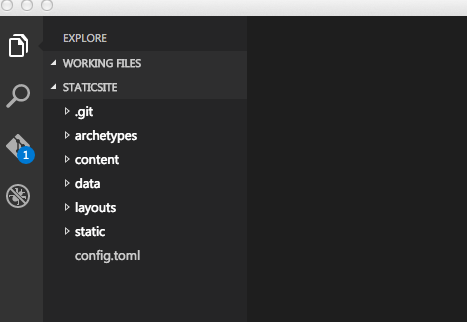 The second post will talk about creating the dev tools extension and connecting to the application. If you visit a site like bugs.mysql.com you will notice it tells you how long it took to generate the page. In my case it said this “Page generated in 0.017 sec. using MySQL 5.6.15-enterprise-commercial-advanced-log”. There are basically two types of logs, the ones that are persisted somehow on the server and others that are sent back to the client somehow. The mysql bugs page is an example of the latter. In this post I will be talking about the sending relevant information back to the client independent of any specific requests. The first can be satisfied by making use of real time protocols such as WebSockets. This will continue to report back to the client even when a request fails. The second can be satisfied by creating a dev tools extension which will receive and display the debug/log information. Again this log lives in the browser and therefore will be independent of individual page requests. 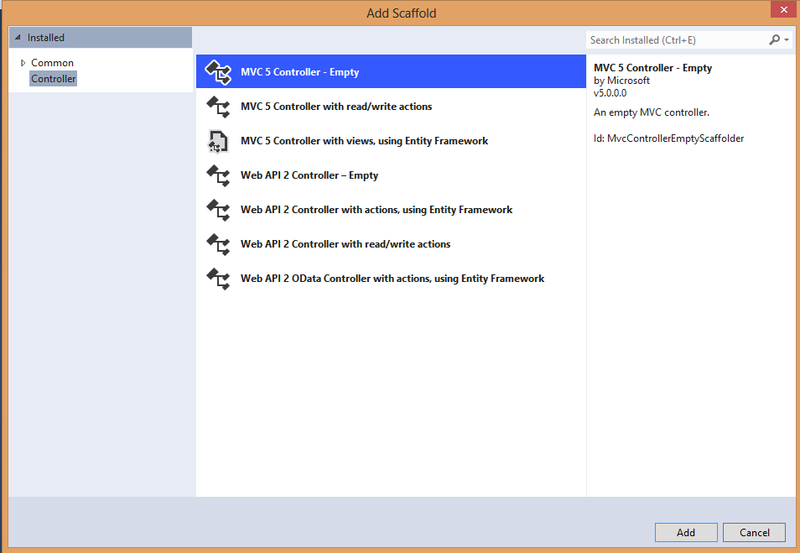 For the past couple years I have worked with asp.net mvc and entity framework quite a bit. Two common task I have are to figure out why certain records aren’t showing up on a given screen and why a given feature is slow. Part of my process is opening up sql profiler and logging any relevant sql queries which come in from the app. With this I can see whether or not the correct filters were applied via where clauses and also how long each individual query took to run. This works ok except that it is yet another window I need to open on my already crowded screen and it isn’t always easy to target the queries I am interested in. So what if instead of opening sql profiler, my sql statements came back to a neat little console in the browser where I am working? All I would have to do is open up dev tools and I would see all the sql activity as it happened. So in effect what I am looking for is a sql profiler but in the browser. One that only shows me relevant information. Before I go on, please note that my chosen technologies are strictly based on the fact that I develop mostly in asp.net mvc on sql server. However, this sort of thing can be done using Node.js and Socket.io or even Mono and XSockets.NET. So although I am doing this using SignalR, my proof of concept was actually done with Node.js and Socket.io. The real time part of this is very simple because SignalR is really easy to setup and use in an application. You won’t even break a sweat adding it after the fact. For logging the sql statements, we will make use of the new interceptor api introduced in entity framework 6. The next class will allow us to send messages via any SignalR hub from anywhere in the application. This class can actually be used for any hub. Next create a class which implements the IDbCommandInterceptor interface. This class will be used to intercept entity framework DbCommands and results and send the sql statements down to the client via our SignalR hub. The above interface gives us access to more than than just sql statements so the possibilities for adding to this class are endless. However, let us just keep it simple for now. Once registered with entity framework, the above class will send the command text of all DbCommands it receives to the client. There are several issues with the current implementation which we can fix later. The first is we assume all CommandText is sql. Another is we are sending messages to everyone instead of just the current user. Next we will create an Entity Framework Code-First database and a client page to initiate queries so we have something to log. 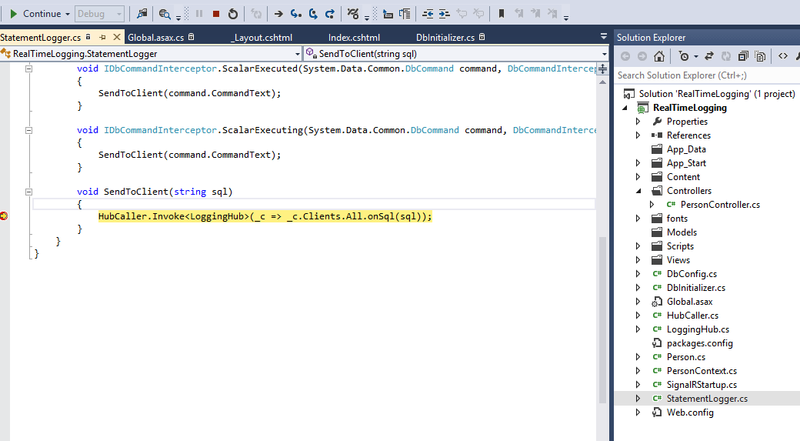 Db config where initializer and interceptor is registered with entity framework. In RouteConfig.cs change the default controller action from “Home” to “Person”. Next include the SingalR client script and a section for views to inject scripts at the bottom of _Layout.cshtml. Set a breakpoint inside the “SendToClient” method and click one of the buttons again. The app should stop at the breakpoint just like mine did. There will be several statements coming through here so you can keep going through to see the sort of commands Entity Framework sends to the database. The code used in this post can be found on Github. The next post will cover creating the dev tools extension which will display the log information. Setting up datatables on the client is very simple for basic scenarios. Here is an example of the markup and the initialization code. Datatables supports displaying columns in any order in the table by setting the mProp property of a column to a specific property in the json result array. For each column, it sends a parameter in the format ‘DataProp_columnIndex = propertyName’. As we can see in our example above, FirstName is the mProp of the first column in the table. It is important to understand these column index property mappings because the sorting and filtering parameters rely on them being interpreted properly. Datatables has a global setting called bSort which disables sorting for the entire table. It also has a property called bSortable which enables/disables sorting for a specific column. For each column, the server side script should search for a parameter in the format ‘bSortable_columnIndex = true/false’. Sorting is determined by parameters with the formats ‘iSortCol_sortCount = columnindex’ and ‘sSortDir_sortCount = asc’ where ‘sortCount’ is the order of sorted parameters and ‘asc’ is the direction that the specific column should be sorted. Datatables has a global setting called bFilter which disables filtering for the entire table. It also has a property called bSearchable which enables/disables filtering for a specific column. For each column, the server side script should search for a parameter in the format ‘bSearchable_columnIndex = true/false’. Filtering works by searching all the searchable columns in a row for any value which contains the filter value in the format ‘sSearch = findMe’. There is also support for filtering on specific columns by using the parameters in the format ‘sSearch_columnIndex = findMe’. The parser supports two separate scenarios which are determined by the provider of the Iqueryable supplied to its constructor; The simple case where all/most processing is handled in memory via Linq to Objects and the more complex case where most/all processing is handled on the database server via Linq to SQL. In linq to sql support we ensure all the expressions sent to entity framework are translatable to valid tsql statements. The goal here is to avoid the cost of bringing most/all the data across the wire and into memory for processing. Imagine a grid for a dataset with 2 million records where you pull in all 2 million records from the database only to send 10 to the client. As an example the following sql statement should be the result of the request it precedes. All the sorting, filtering and paging parameters have been translated and are represented in the tsql statement. The ‘iDisplayStart’ property determines the start of a page of data and iDisplayLength determines the length of each page of data. The biggest feature missing from the parser is processing individual search filters. Originally, the individual property search and the generic search were implemented as two separate functions. However, I am convinced that the bulk of the logic in the generic search can be generalized to also handle the individual property such. I am open to any ideas on this one. I have also been asked about sorting/filtering on sub properties. This should be possible in linq to objects but I have not been able to look into it. The parser is definitely a work in progress in the sense that it is always being improved whenever possible but it certainly saves time when using the datatables plugin for grids. Please note that the NPM version up until the publishing of this post does not have the most up to date fixes and changes. I plan to update the NPM package as soon as the new changes have been thoroughly tested.